Well the summer has been and almost gone and it has been really busy.I had the Post Medieval module to study from June which I found very interesting. The problem however, was that I also work full time and needed to fit in: 1. Our holidays and 2. A field school; not to mention being on call from work for the week leading up to essay submission. This module had to be very carefully time managed! Our holidays entailed back to back cruises. The first was to the Adriatic including, Venice, Kotor, Koper,Dubrovnik and Split and the second was Athens, Mykonos, Olympia, Chania. These were fantastic cruises which my wife and I will remember forever. 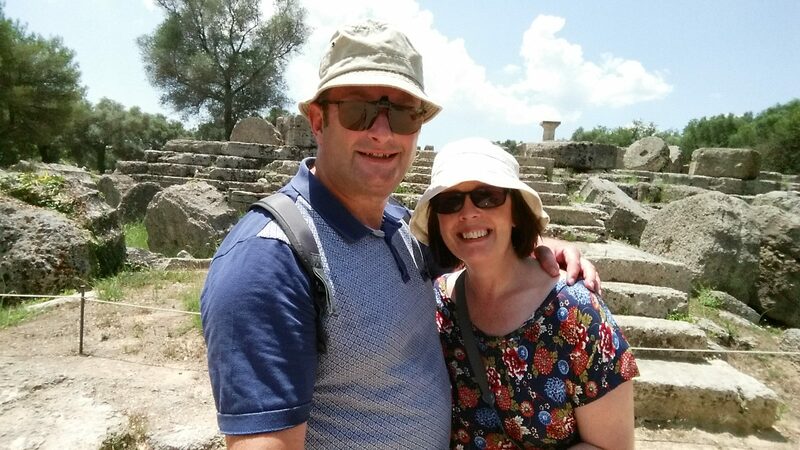 Louise and I in front of the temple of Zeus at Olympia. During this holiday I managed to, not only keep up with my studies but also to get in front, which would be very beneficial in the weeks to come. 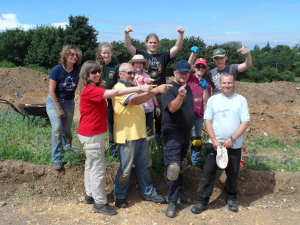 In July I undertook a BERT (basic excavation and recording training) course at SHARP (Sedgeford Historical and Archaeological Research Project) in Norfolk. This was a fantastic course with superb people. We all gelled immediately and were made very welcome by the SHARP regulars. My learning outcomes were achieved and I definitely recommend SHARP to anyone. Week three BERT course with me holding the late Neolithic arrowhead I had just excavated. I am now preparing for my next module, Interpreting Archaeological Evidence but, next week we have a late summer cruise to the south of France and Spain to look forward to which includes a visit to a museum of underwater archaeology! Until next time, best wishes, Mark. Hi, I'm Mark from Melton Mowbray in Leicestershire. 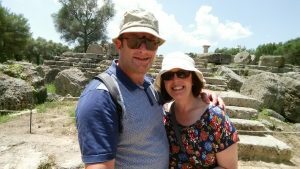 I am currently about to start my third year of study on the part time Archaeology BA distance learning course. I am married with grown up children and five grandsons and one grandaughter. I work full time for Severn Trent Water but have an Army background. I am loving the course so far and would encourage anyone with a passion for Archaeology to follow me to Leicester. Thank you very much for the comments Marcel, Petrie was a real inspiration! Have you considered joining us at Leicester at all? The BERT course sounds awesome!! I am currently reading Temples, Tombs and Hieroglyphs; The Story of Egyptology by Barbara Mertz. It’s a dated book but still very interesting. It also talks about William (Flinders) Petrie who is the pioneer of systematic methodology. There’s one part of the book where it describes how Petrie lay on his back for a few hours in a tiny passage in a pyramid. His body was submerged under filthy water and only his face above his ears was protruding above the water as he took down inscription details. Btw it’s great to see an older fellow following his dream to get an BA in Archaeology. Well done! !